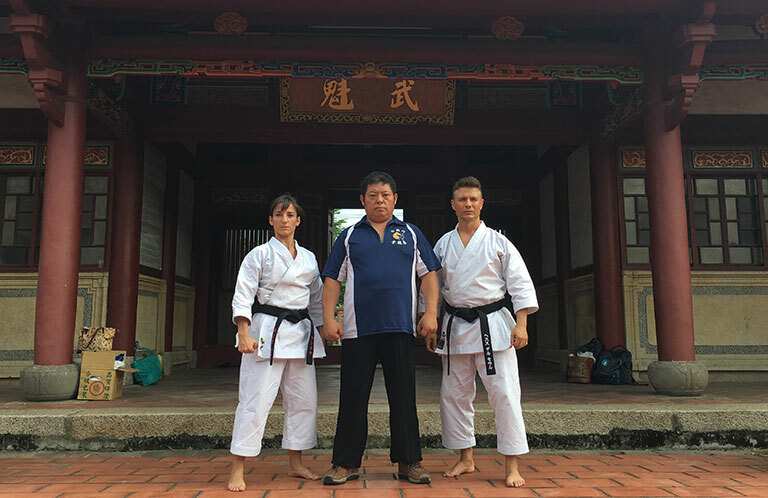 We have been training karate for a long time now; thus, we have been lucky to visit different countries, which has allowed us to get to know different cultures and extraordinary places. — This kata seems to have been created for you, it is your kata: “Pappuren”. About five years ago, I could get a book based on the fighting system of the “White Crane”. This text included valuable information about the origins of this system as well as different training methods. Nevertheless, the key discovery I could find in this book was the passage in which the “White Crane” was defined as the starting point of karate-do. We realised we had to visit Osaka in order to learn and internalise this kata. In fact, apart from assimilating its techniques, we could learn the origins of this kata. Consequently, we tried to take advantage of this incredible experience by including Pappuren in my daily training. Along the way, I decided to perform this kata in exhibitions as an attempt to collect as much feedback as possible from referees and other competitors. As most opinions were favourable, we continued working on this kata, trying to improve my performance as much as possible and waiting for the exact moment to display my Pappuren in competition. In particular, this reveal took place three years later, which implied great results by helping me to get the gold medal in the European Championships and the European Games as well as achieve the 1st place in the World ranking. Even though the results in competitions were on a roll, I could feel we were missing something essential. Specifically, we wanted to feel the essence of the “White Crane” by visiting its place of origin. 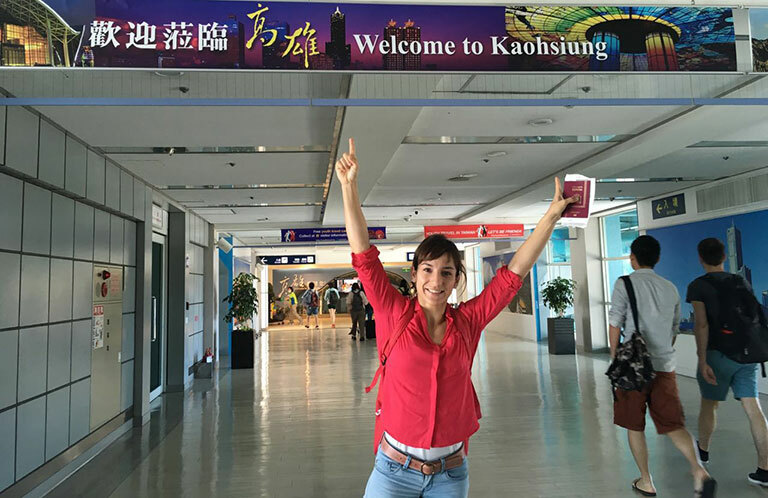 Thus, we decided to visit the ancient and wonderful island of Formosa (Taiwan), the place where the “White Crane” first came into the world as the “Feeding Crane”. Despite the extreme heat and relative humidity in the island, this trip filled us with excitement. Besides, at the very moment we were kindly welcomed by an apprentice of the Shifu, we found someone who spoke Spanish, since Oscar – as he told us we could call him – had spent part of his childhood in Venezuela. Finally, we could reach the Master’s home, who embraced us with hospitality. After having a cup of tea and enjoying ourselves conversing with him for a long time in order to get to know each other. Shifu Liu Chang I is the fourth generation in the “White Crane” and living symbol of the “Feeding Crane”. Of course, we had read plenty of texts about him, which made this meeting a wonderful experience for us, since we could finally get to know the origins of the “White Crane”. After enjoying our conversation with him, the Shifu drove us to the hotel, so we could rest and get ready for an intense forthcoming week! When we met the Shifu next morning, we could converse about several books and historical texts, which amazed Liu Chang. That is, he was surprised due to our knowledge and interest in the White Crane. Certainly, the assistance of several of his apprentices by translating along our conversations was essential. 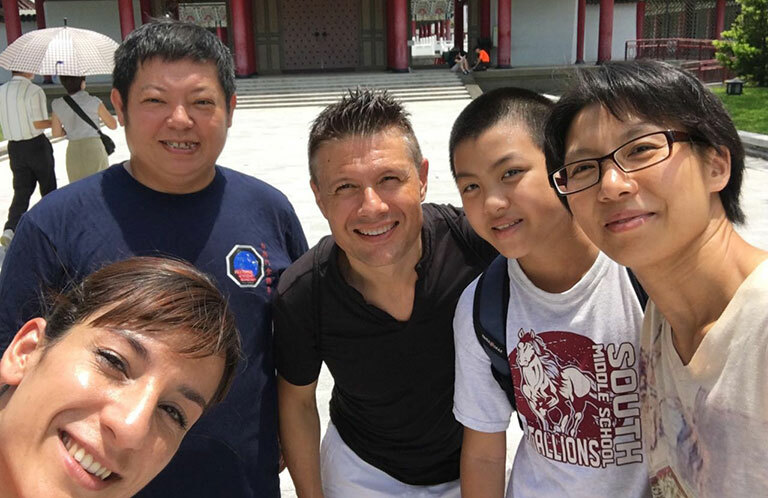 Surely, this journey was also special because of the personal treatment that Shifu Liu gave us, since we could even feel as a part of his family. While we spent every morning conversing, we trained in the evening. 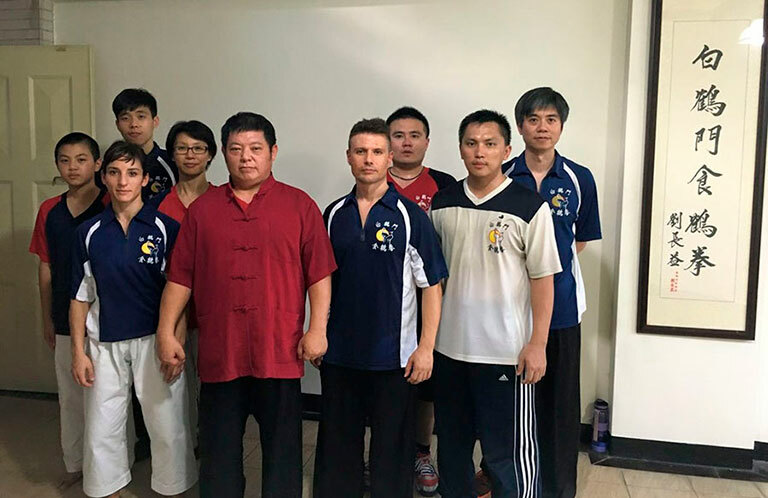 Certainly, the original training methods together with the tough level made the first sessions really hard for us. 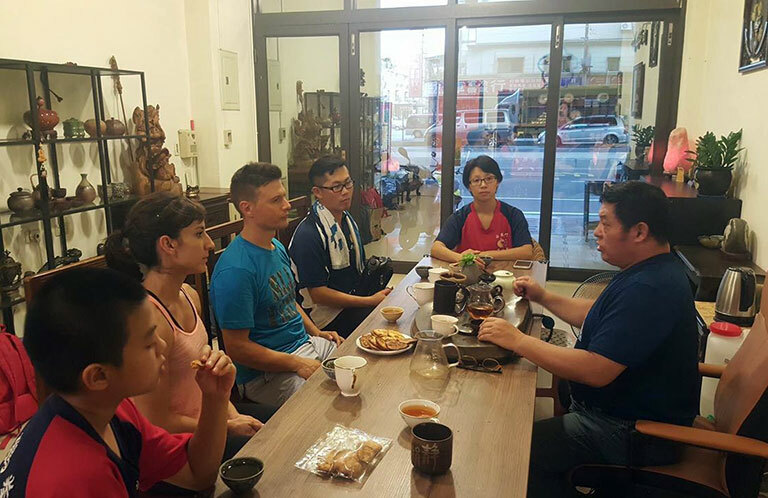 Shifu Chang congratulated Sandra on her physical condition and her fast-learning capacity, as he was amazed at her fortitude and spirit. I had already read about the differences of the “Feeding Crane” to other methods; specifically, every ligament in our bodies were to be pushed to their limits in the following days! To illustrate, the different training exercises were really tough physically as well as rich in Chi kung details. Of course, I had plenty of questions ready to ask the Shifu. For instance, I was eager to know what “Thunder Power” or “Fa jin” meant, since Chojun Miyagi was said to have it. Nonetheless, I had not been able to find anyone who answered this question. Then, Shifu Chang decided to show me the peculiarities of this habit by performing a specific exercise. In particular, I could feel an explosive discharge in my whole body, which ended in a strong bang, as a lightning. At that moment, I was surprised and immensely satisfied, as I had already found out what “Thunder Power” was. Then, it was time to work on it! 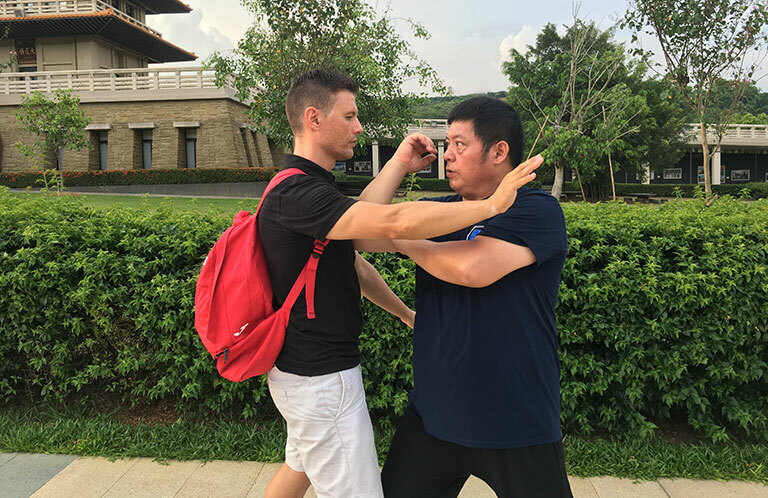 The methodology based on the “Feeding Crane” is not only an effective fighting system of hand to hand combat, but an excellent mechanism to acquire valuable knowledge of internal energy, acupuncture, traditional Chinese medicine and the relationship with the five elements. In addition, training is divided in three different levels. Also, working hard and continuously is the key to achieve the discipline goals. Furthermore, the force and power developed in every technique while practicing “Feeding Crane” is something to keep in mind. That is, in this fighting system, effectiveness when hitting comes first if compared to elegance, prioritising attack by aiming to vital parts which are performed in succession until the aggressor is neutralised. “White Crane” was created as a fighting system for women. Thus, the basic principle implies not giving a second chance to the aggressor, since female gender is theoretically physically weaker than male and, therefore, every technique must be most effective. Even now, I still remember how lucky Shifu Chang felt about having found such a strong woman when observing Sandra in training. We were lucky to feel the internal energy that Shifu Chang reflected in every application. In particular, our favourite application was the detailed study of Pappuren from the perspective of the characteristics developed in the White Crane… which allowed us to take plenty of notes that, later on, guided our training in search of improvement. Nonetheless, we were even luckier when the moment of visiting historical places related to the “Feeding Crane” came. Specifically, these places were those where Shifu Chang, his father and his grandfather before him could learn everything about this fighting system. Surely, this visit also allowed us to know their family tree from the origins of the family. Likewise, we could feel something special and difficult to describe at the same time. In other words, training in this historical place was a magical experience we will never forget. All in all, the company was our luckiest discovery! Clearly, this trip was very important in terms of learning – both theoretically and practically – the White Crane. Nonetheless, our luckiest discovery was the amazing people we could meet, since they embraced us as one of them from the very first moment. For this reason, we would like to thank Shifu Liu Chang his immense hospitality by allowing us to stay in his own home. Of course, his mother, who is – in fact – the person that taught him the “Feeding Crane” by observing his practice every day and giving him feedback and counsel. Also, all his excellent apprentices: Óscar, Yeu-Kei and Shifu’s sons. In short, we consider this trip as a first contact to this world, since there is still a long way to go along this discipline. Similarly, this might be a good instrument for other karate practitioners to get to know the origins of karate and the multiple benefits we can get.